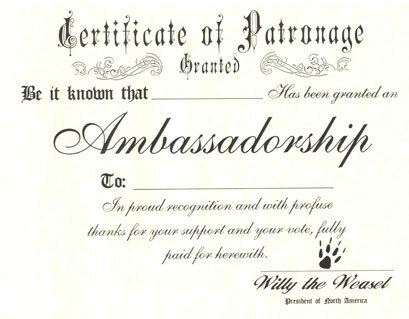 SUPPORT WILLY IN HIS BID FOR THE PRESIDENCY OF NORTH AMERICA. WILL BUY YOU AN AMBASSORSHIP TO WHEREVER YOU WANT! HANDSOME CERTIFICATE IS COPIED ON PARCHEMENT PAPER. WILL LOOK GREAT IN HOME, OFFICE OR TENT! WILLY ACCEPTS VISA, MASTER CARD, AMERICAN EXPRESS, CASH, CHEQUES, MONEY ORDERS AND LIVESTOCK! ORDER NOW! Book the weasel for your event! 905-884-9060! Tell 'em Willy sent you!